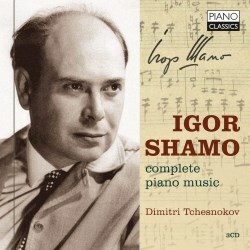 Ukrainian composer Igor Shamo has not cut as much exposure mustard as many of his contemporaries. In those terms he is no Weinberg, Shaporin (when will some company chance its arm on Shaporin’s 1930s Symphony?) or Kapustin. It is therefore all the more remarkable - and meriting welcome - that out of a clear blue sky comes this 3-CD set of his complete piano music. Across these three discs Shamo has 52 pieces grouped into suites and preludes alongside freestanding solos. That's getting on for 200 minutes of music to add to the world's store. They were written between 1948 and 1972. First some biographical essentials. He died young. At a second attempt he managed to sign up for military service in the Soviet army which took him to Berlin in 1945. He was born in Kiev and had tuition there at the Lysenko School of Music before post-war studies at the Kiev Conservatoire with Boris Lyatoshinsky. He idolised Bach but his piano music surges in other directions. A vibrant clarity and rhythmic nationalistic life are its hallmarks. His song (My Kiev) is said to be regarded as the "unofficial anthem of the Ukrainian capital". There are also three symphonies and an opera as well as film music. A small clutch of his works were recorded by Melodiya, as were those of his son Igor (1925-1982). This is a Piano Classics issue and as you may know that label has no fear of retrospective style: here we are treated to nationalism cut with hempen fibres culled from folk melodies, songs and dances. There is nothing here of the avant-garde indeed much of it will be a draw for those who prize Kirsten Johnson's very accessible Guild collections of Albanian music (Kenge and Rapsodi). CD 1 associates itself with music from the 1940s and 1950s. In the Ukrainian Suite the Melody movement is strikingly perfumed and grandly stated. The Russian Painter Pictures are again far from anything approaching modernism but they are exquisitely shaped, rounded and sounded out by Dmitri Tchesnokov. Here is a pianist who need have no fear that his no doubt challenging preparatory work has done anything other than borne ripe romantic fruit. Morning in the Woods is a Grieg-like flight of free dewy fancies. The seven-minute Volodymyrka has a more epic spirit about it to match its timescale. The six-minute Classical Suite of 1958 sports movement titles such as Prelude, Aria and Gavotte but Shamo stands well clear of any hint of powdered wigs and overly-precious invention. The music occasionally drifts into Capriol territory and makes forays into nursery songs. However, the overwhelming flavour is again nationalistic and romantic. There is an oh-so-gentle but distinctive gear change for the Hutsul Aquarelles and the most subtle of these is Sunrise in the Mountains with its exultant sprays of notes to punctuate the mistily suggestive writing. Much of this is characterised by tonal collisions although the shrapnel, when it flies, never flies far from the nationalist camp. Spring Rain is less an evocation of raindrops and more of a rumbling angry storm although one can feel the shiver and spatter of rain. The dark caste of the writing ruminates around Bartók and his Allegro Barbaro and Griffes' Kubla Khan and Clouds. A pent-up Bartókian energy is there in both suppression and in release. Shamo's Twelve Preludes are from a decade earlier. They too have a measure of complexity of harmony but stand back from ploughing up the boundaries to the same extent as the Hutsul work. No. 14. The Bumblebee prelude hardly pauses to take breath - it's somewhere between the Tropic of Cancer that is Sinding's Rustle of Spring and the Tropic of Capricorn that is Rimsky's won Bumblebee. The third disc features, forward and centre, the most profound of the grouped pieces, the so-called Tarasova Doumi. Its rumbling storm-fronts and hammer-and-anvil conflicts speak of the tragic history of the Ukraine. It is perhaps the most personal of all Shamo's music here. The three 1954 Songs of Friendship speak of amicable respect for collegiate states in the USSR, namely Poland, Romania and the then Czechoslovakia. These are nationalistic essays without much tonal complexity. from the same year as the free-standing and highly motile Toccata. There’s a contrast with the gently circling Horovodna which ascends to bell-swung grandeur. The 1946 humoresque is a relaxed flight of fancy which the 20 year-old Shamo could be proud of; he even nods in admiration toward Prokofiev in the counter-melody. The Three Dances of 1972 parallel the invention and spirit of the Songs of Friendship but here Shamo makes eyes of amity in these whirling and prismatically unruly dances towards the Uzbek, Azerbaijani and Armenian lands. The simple Scherzo with its guileless, halting, music-box ways should win Shamo new friends among beginners. We end with a work which may well have snagged the enthusiasm of the pianist, Dmitri Tchesnokov, here, the Fantastic March. Tchesnokov also proves himself well up to Shamo's inventive and inspired ways - for example the perfumed melody at 2:15 in the Fantastic March. Such fresh invention at the age of 20! The pianist contributes a booklet essay in English and French and there’s a short introduction by Tamara Nevinchana. Both writers address the essentials rather than adopting a discursive approach. The sound is clear as a bell and agreeably close. Shamo stood away from examples of extreme retrospective styles such as those adopted by Swiss composer Richard Flury or the almost disconcerting kitsch-music pieces by Valentin Silvestrov. Ready yourself, then, for a composer whose feet are planted squarely in folk/romantic tilth but who, as the years went by, allowed entry to slightly more advanced idioms. I rather hope that someone will feel encouraged to record Shamo's symphonies.